The big day is only a couple of weeks away, and if you are anything like myself, you are struggling to know what to get folks. I find it much more difficult these days, and I often look online for inspiration. I have been sent a few bits and bobs which I have trying out and would like to share with you, possibly providing you with a spot of inspiration in the gift department. First off we have the couch coaster. This would be a great gadget for anyone who loves sitting on the sofa, watching TV with a drink at their side. It’s made from silicone and has weighted ends which grip to the side of the arm of your chair. Your drink fits in the cup holder, which even has a notch for your cup handle. There is a detachable insert for smaller cups or glasses, so it will accommodate most sizes. A handy piece and ideal for entertaining too if you don’t have enough table space for for all those glasses. 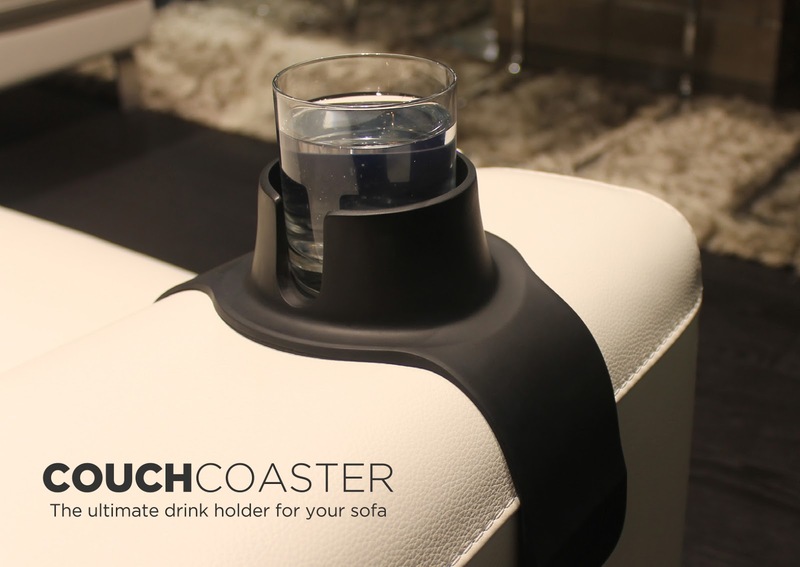 £19.99 from the Couch Coaster website. Next, possibly something to put in said couch coaster, Parley rum. If you are partial to dark rum, you will love Parlay which is described as ultra-black. The rum is flavoured with cherries, vanilla, raisins and tangerines. It is a unique rum, but will be loved by those with a taste for the dark side. Available online from the official Parlay website at £28 for a 500ml bottle. 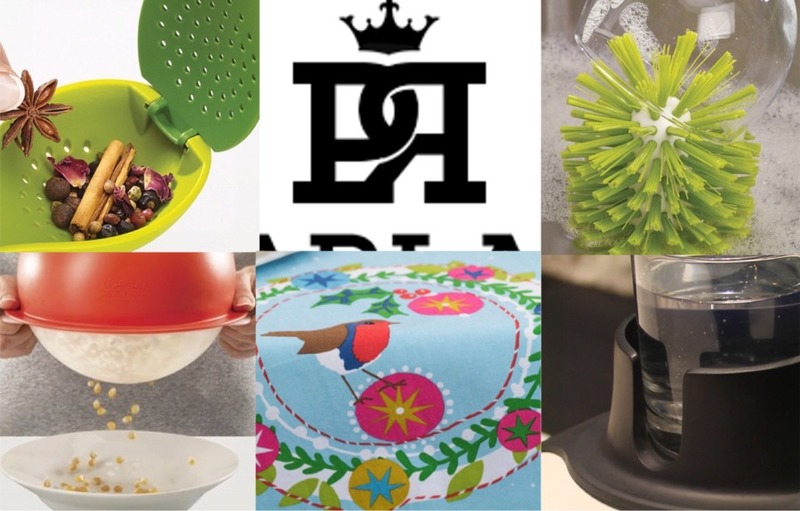 Now we have a few kitchen gadgets from Joseph Joseph which would be a great addition to anyone’s stocking. Firstly we have the Gusto, the flavour infusing spoon. I plan to use mine for Christmas dinner. 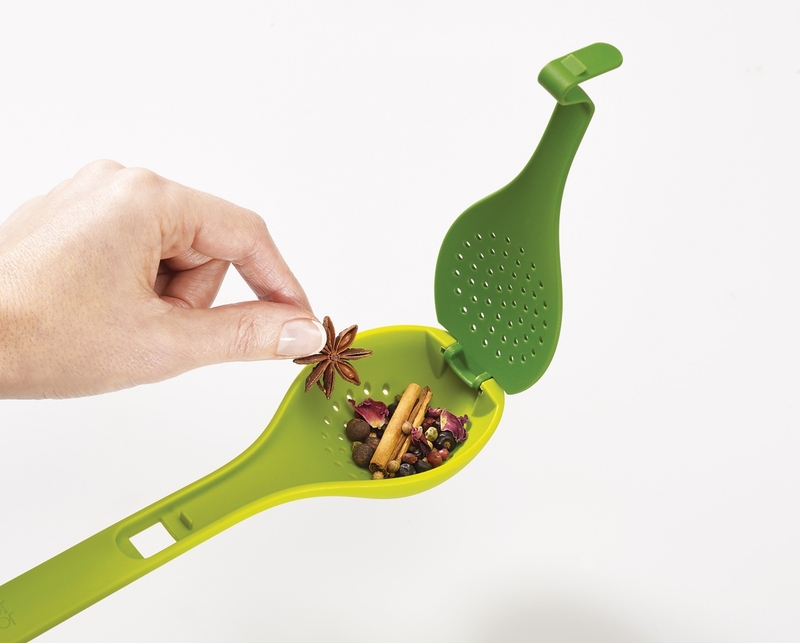 It’s a spoon with a compartment built in to put herbs and spices. You can then stir your gravy for example and infuse the flavours from the spoon which has holes in it to allow the flavours to come through. At the end of the spoon is also an integrated herb stripper which you pop the stalk through, pull and all the leaves come off ready to bundle into the spoon. How good an idea is that? £6 from the Joseph Joseph site. The M-Cuisine popcorn maker, comes from Joseph Joseph’s microwave range and, you’ve guessed it, makes popcorn in the microwave. This is such a handy and healthy item to give someone. Popcorn popped without fat, which this gadget does, is a super healthy snack. Simply pop in some popcorn kernels, set the microwave for 5 minutes and listen to all those kernels popping. It has an integrated kernel sifter to get rid of those annoying unpopped bits. Then you can flavour if you wish straight in the bowl. So easy! £20 from the Joseph Joseph site. Joseph Joseph also sent me their in-sink washing up brush Brush-Up. This item has a sucker on one end that you stick in your sink and the other end is a brush, ideal to scrub your glasses or cups. I use mine before popping the glasses in the dishwasher to get rid of those annoying bits of red wine that cling. 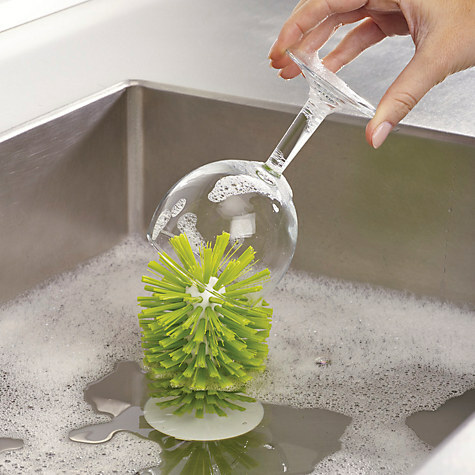 A useful tool for those without dishwashers and those with also! £8 from the Joseph Joseph website. Lastly Ulster Weavers sent me a selection of their bright and cheerful Frosty Garland range. In the box was a a double oven mitt, a stylish apron and tea towel all featuring their new Frosty Garland design which is full of bright colours of blues, pinks and features lots of wee birds in wreaths. Very cute. The apron retails at £16, the double oven glove £13 and the tea towel £6.50 all from the Ulster Weavers website. And there we have a few great items which have made their way into my home and I hope have inspired you in your last minute Christmas gift buying. Disclosure Statement: I was sent the above items free to review and any opinions expressed are my own.